Composition shingles are undoubtedly the most common materials on the residential roofing market. Chances are high that if you drive through a neighborhood, most of the houses you see will have roofs made of composition shingles. 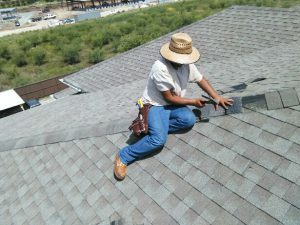 These shingles are composed of asphalt and fiberglass, and are relatively cheap, fire-resistant, and easy to install. They’re also a great bargain despite not being as durable as some other higher-priced roofing materials. These shingles are the most common type because they’re the easiest to maintain and some of the least expensive roofing materials. They’re a one-layer product with a pattern of three tabs caused by vertical slots notched into each shingle, hence the name. 3-tab composition shingles usually come with manufacturer’s warranties of 20-30 years. Also called dimensional, these shingles are considered an upgrade to 3-tab shingles. They have a second tabbed layer that doubles the thickness of the material, and typically come with manufacturer’s warranties of 30-50 years. These shingles are generally considered to be at the top of the line. They’re made to look like slabs and are laid on top of each other for a very strong roof. Unlike standard laminates, they’re thicker, heavier, larger, and sometimes come with extra features like moss resistance. Some architectural shingles come with manufacturer’s warranties of 50 years to up to a lifetime. Composition shingles are a great choice because they’re affordable, highly durable, and come in a variety of colors, textures, and styles. They can also help to keep energy costs down by reflecting UV and heat rays, and help prevent mold, algae, and fungus growth.